Lockheed Martin CEO Marillyn Hewson met with Donald Trump in December. Hewson made another trek to Trump Tower and the meeting appeared to be favorable for the F-35’s future — and Lockheed’s thousands of employees in Fort Worth. “We had the opportunity to talk to him about the F-35 program" Martin said. “In fact, we are going to increase our jobs in Fort Worth by 1,800 jobs, and when you think about the supply chain across 45 states in the U.S. it’s going to be thousands and thousands of jobs,” Hewson said. “And I also had the opportunity to give him some ideas on things we think we can do to continue to drive the cost down on the F-35 program, so it was a great meeting.” The Naval Air Station Joint Reserve Base Fort Worth was announced as a home for a squadron of F-35 jets. Anthony Scaramucci, a 'marriage equality' supporter, who was recently reported would take a top post in Donald Trump's White House, described his role to reporters Friday morning in Trump Tower. “It’s pretty much as described,” the SkyBridge Capital founder said. “It’ll be in the Office of Public Liaison, really trying to get the President’s message out, not only to the intergovernmental agencies, but also the commercial message to both American businesses and the international business community." The White House Office of Public Engagement and Intergovernmental Affairs—formerly known as the Office of Public Liaison and Intergovernmental Affairs—is currently led by Valerie Jarrett, one of President Barack Obama’s closest confidantes. The Washington Post reported Thursday that, according to two unnamed transition officials, Scaramucci's role would be akin to Jarret’s. Trump's transition team has not formally announced a position for Scaramucci. Scaramucci told reporters the comparison to Jarrett was probably an “overstatement." Hewson made another trek to Trump Tower and the meeting appeared to be favorable for the F-35’s future — and Lockheed’s thousands of employees in Fort Worth. 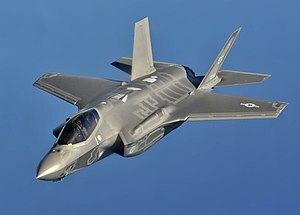 “We had the opportunity to talk to him about the F-35 program, and I certainly share his views that we need to get the best capability to our men and women in uniform and we have to get it at the lowest possible price,” Hewson said to reporters. “So I’m glad I had the opportunity to tell him that we are close to a deal that will bring the cost down significantly from the previous lot of aircraft to the next lot of aircraft, and moreover it’s going to bring a lot of jobs to the United States.” Curtailing the costs of the Department of Defense’s most expensive weapons program in history won’t lead to fewer jobs, according to Hewson. “In fact, we are going to increase our jobs in Fort Worth by 1,800 jobs"